The story of Alfred Packard, his five companions, and their dire trip across the Rocky Mountains. Before "The Book of Mormon," before "Team America: World Police," before "South Park," and even before "Orgazmo," there was "Cannibal! The Musical." Loosely inspired by a true story, "Cannibal! 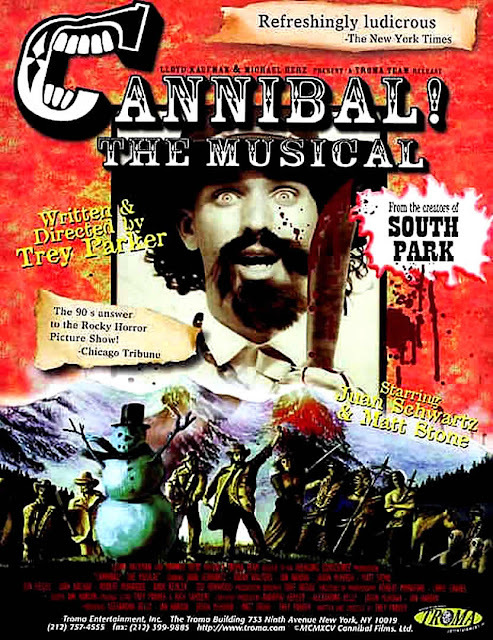 The Musical" is written and directed by Trey Parker. Parker and his partner, Matt Stone, would go on to create all of the aforementioned successful films, plays, and TV shows. Parker also stars in this movie as Alfred Packard, a man on trial for murder and cannibalism. Packard and a group of Utahn prospectors who are trying to reach Breckenridge, Colorado get trapped in the Rocky Mountains during a snowstorm and are forced to resort to cannibalism to stay alive. Wouldn't you? Oh yeah, did we mention this is a musical AND a comedy? A story about a murder trial and cannibalism doesn't exactly sound like it would be funny. However, if you understand Parker's off-beat, satirical sense of humor, you'll understand why it's humorous. Parker has always embraced music in his storytelling as a source of comedy, and he uses it to great effect here. He parodies many classic musicals, most notably "Oklahoma!." Parker clearly took inspiration from the song "Oh What a Beautiful Morning" and as such, turns it into "Shpadoinkle," a song that observes how "shpadoinkle" everything is, from the blue sky to the green leaves to how the sun is as warm as a baked potato. What does shpadoinkle mean? Who really knows?! The definition seems to change throughout the course of the film. Sometimes it is used to express joy and happiness, and other times it is used as a euphemism for a curse word.The other tunes are just as entertaining and goofy, and they work well in the context of the movie. Apart from the music, there is a lot of blood and violence. Both are extremely over the top, so much so that they are meant to be cartoonish and are played for laughs. Is "Cannibal! The Musical" stupid? Absolutely, and it embraces this stupidity 100%. While it definitely won't be for everyone, for fans of Matt Stone, Trey Parker, and their work on any of their other projects mentioned earlier, this is a must-see. Besides, it is good to see how these guys got their start. It's the kind of project that can give hope to up and coming filmmakers who are presently making crappy micro-budget projects with their friends. They will see that it took years of work for Matt and Trey to become who they are today. They may not have hit it out of the park on their first try, but this was a hell of a start.